Tinderbox Theatre Company has teamed up with award-winning playwright Stacey Gregg and fast-rising music star Katie Richardson to create Huzzies for the 50th Ulster Bank Belfast Festival at Queens. Fighting to escape from the shadow of her dysfunctional family, Dee brings together the unlikely talents of Shona, Claire and Pete to form a band. 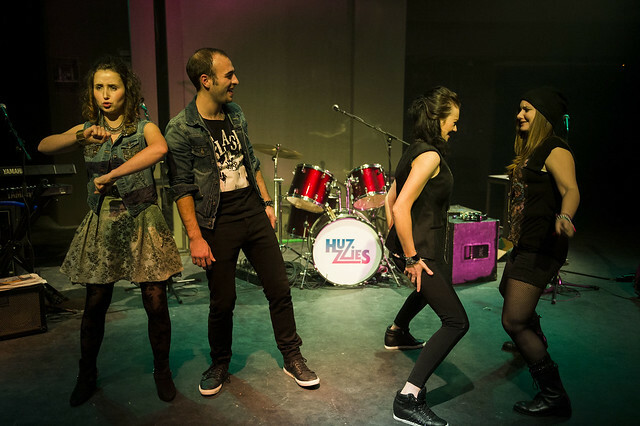 Fast-paced, direct and full of Stacey Gregg’s trademark wit, the play follows them as they hurl themselves at the music scene. Each other’s best friends and their own worst enemies, the band stumbles from dodgy covers to true inspiration. But just as the success Dee craves seems possible, she faces a terrible choice that threatens all their futures. Katie Richardson’s brilliant collection of specially composed songs are performed live by a stellar cast of actor-musicians that includes Kerri Quinn, Cat Barter, Doireann McKenna and John Shayegh.